August 24: The U.S. Federal Census enumerated in Maury County, TN showed Henry living with his parents Jacob and Harriett and siblings. June 3: The U.S. Federal Census enumerated in Franklin, Williamson County, TN showed Henry living with his parents Jacob and Harriett and siblings. April 29: Enlisted in the Confederate Army. Promoted to Full Chaplain. December 31 – April 30 (62): Company Muster Roll. Present. –listed as Forage Master. February 24 – June 30: Company Muster Roll. Present. “Detailed forage master Nov. 1. 1861.” ---listed as Forage Master. July and August: Company Muster Roll. Present. Remarks “Detailed as Regt forage master Nov. 1. 1861.” –listed as Forage Master. March and April: Company Muster Roll. Present. September and October: Company Muster Roll. Present. June 6: The U.S. Federal Census enumerated in Nashville, Davidson County, TN showed Henry, a preacher, living with his parents and siblings. August 23: Henry married Clara Dill in Morris, KS. June 8: The U.S. Federal Census enumerated in Atchison, Atchison County, KS showed Henry, a minister, living with his wife, Clara, and their daughters Hattie and Jessie. June 22: The U.S. Federal Census taken in Rosedale, Wyandotte County, KS showed Henry, a Methodist minister, and Clara living with their children: Mary, Ada, Henry, Edward, Cora and Nellie. April 25: The U.S. Federal Census enumerated in Oxford, Johnson County, KS showed widowed Henry, a farmer, living with his children: Ada, Edward, Cora and Nellie. January 3: The U.S. Federal Census enumerated in Rosedale, Wyandotte County, KS showed a widowed 80 year old Henry living with his daughter Ada. 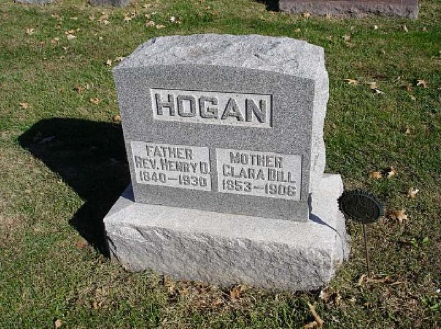 March 12: Henry D. Hogan died at his daughter’s house in Kansas. 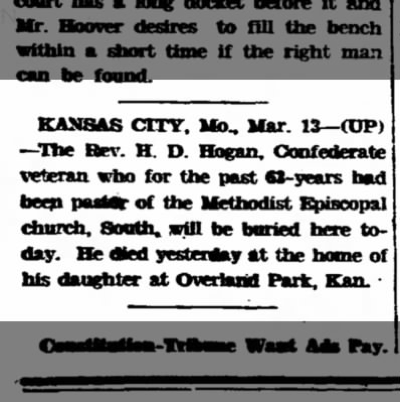 March 13: The following obituary appears in The Chillichothe Constitution- Tribune, Chillichothe, MO. Henry is buried in Pleasant Valley Cemetery in Johnson County, KS.